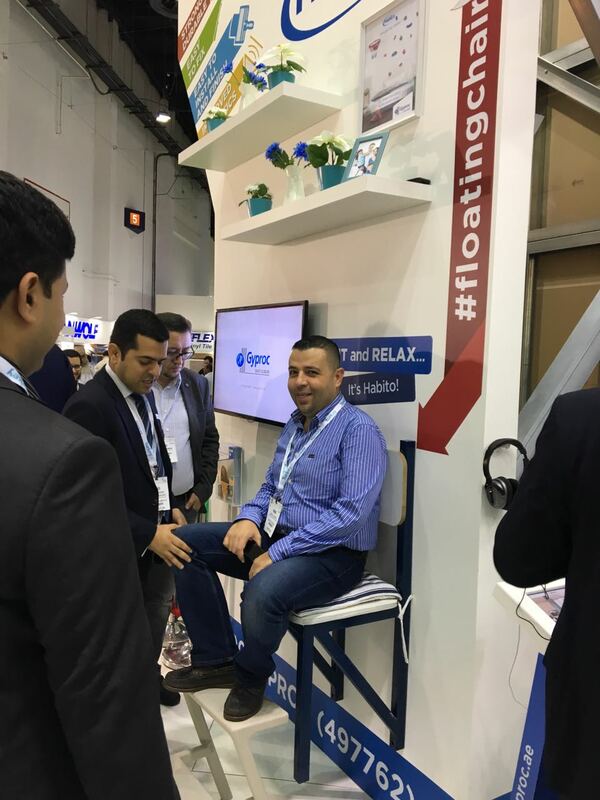 An innovative high strength Gyproc plasterboard that supports heavy fixings using only standard 5mm chipboard screws has surprised and amazed visitors to the Middle East’s leading construction event and exhibition. Manufactured using groundbreaking new technology, Gyproc Habito board has a high strength dense gypsum core that gives it outstanding impact strength and fixing capabilities. It has been designed to provide a robust, fast-build alternative to traditional blockwork construction for a range of building types, from hospitals and schools to hotels, offices and residential apartments, and villas. To demonstrate the performance of the new board, market leading high performance systems manufacturer, Gyproc, staged a high profile launch at the BIG 5 exhibition, held in Dubai’s World Trade Centre from 21-24 November. Show-stopping displays, including a ‘floating chair’ in which visitors could sit, suspended in mid-air, and a unique Habito climbing wall built from a template designed and first used in Belgium. A team of professional climbers demonstrated the fixing strength of the new board by climbing to the top of the wall using small climbing holds fixed directly into the plasterboard using only standard 5mm chipboard screws. 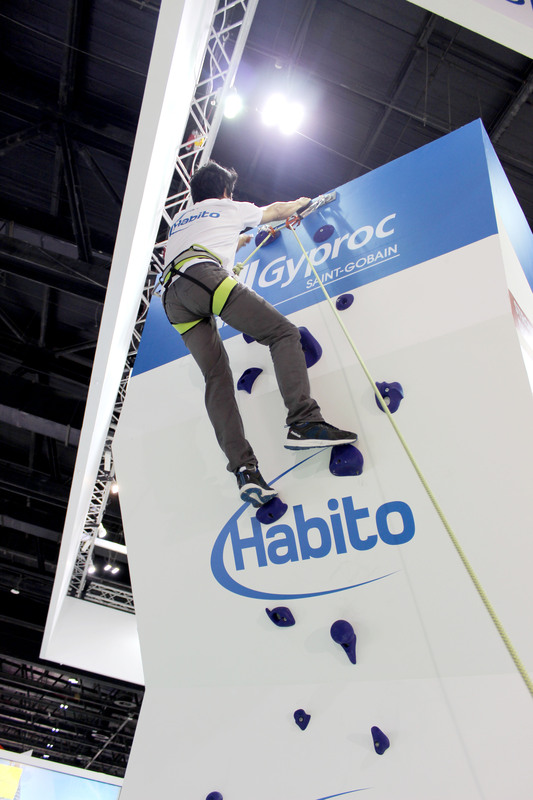 The Gyproc stand, part of a joint display with Saint-Gobain sister companies from throughout the Middle East, quickly became the highlight of Hall 5, with crowds flocking to see the Habito displays in increasing numbers throughout the open period. Whilst many architects, contractors and other building professional visiting the show – now the Middle East’s leading annual construction event – were happy to trial the floating chair and, in lesser numbers, try their hand at the climbing wall, those of a less adventurous nature had the opportunity to see for themselves how quickly and easily heavy fixtures such as TV’s and shelving units could be fixed to Habito, with a separate ‘have-a-go’ display. Gyproc’s Managing Director, Paul Button, was on hand, alongside Gyproc’s sales and technical personnel, to welcome visitors and discuss other recent innovations that are making Gyproc one of the fastest growing construction products manufacturers in the Middle East. Of course, Habito was the big talking point for visitors and stand personnel alike, so every visitor left the stand with copies of new Habito brochure and datasheet, so they could learn more - and discuss their experience with colleagues and clients.